We are Manufacture directly, True good Quality with very professional, buy with confidence! This product is an Aluminum Extrusion for your LED Strip Lights installation .These aluminum channels are not only a great housing for LED strip lights but also act as a heat sink for them as well, which in turn will expand your LEDs lifetime as well as brightness over time. The frosted covers conceal the LED strip and make for a professional looking light fixture. This profile is compact, slim, and easy to install, perfect for under cabinet, under stairs, closets, exhibits, furniture, work stations, etc. Q:Can the aluminum channel be joined together end to end? 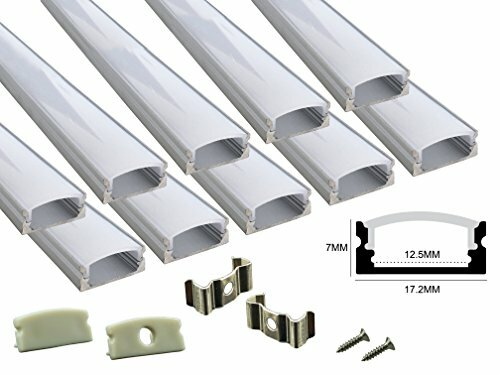 They can be join like a single piece with the extension connector (search B072KMRXSX),You can purchase 2M (6.6ft) LED channels (search B074K1FKRM) for longer lighting project. Q: Do you have any angles that can go around corners? We provide L-shape corner adapter(search B0714BY2KD ) connect the aluminum channels at 90 degree angle turning. Q:Does it fit Philips hue plus 2nd Generation? 1 pack contains 10 segments of channels. Each segment is 1meter(3.3ft) , Total length is 10meter/33ft. Come with 10pcs of milky pc cover, 20pcs of end caps,20pcs of mounting clips, 40pcs of screws. The channels can be cut down to any length. Need extra mounting clips and end caps: please search B06WW2FFR6. The channels can be joined with extension connector (search B072KMRXSX) for longer distance lighting projects. Or you may also search B074K1FKRM to purchase 2M (6.6ft) LED channels. The channels are fairly stiff not designed for bending. We provide L-shape corner adapter(search B0714BY2KD ) connect the aluminum channels at 90 degree angle turning. The u-shaped aluminum channel is anodized extruded and better heat dissipation; Milky white pc diffuser works well to help spread the light more evenly. If you have any questions about this product by Muzata, contact us by completing and submitting the form below. If you are looking for a specif part number, please include it with your message.